Filling the space between Monticello Carpets & Interiors and Grand China, the Pocket Park provides 2100 square feet of community space for events, gatherings, picnic lunches and more. Recent improvement to a neighboring lot provides access to downtown businesses and serves as a stage and overflow area for downtown events. 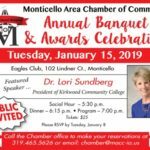 Although no City taxpayer funds were used in the creation of the Pocket Park, the Monticello Area Chamber of Commerce and City of Monticello work on mutually beneficial improvements to the Downtown area. The new city parking lot on Grand Street provides direct access to the Pocket Park and to Downtown businesses. The parking lot opens into a stage area that provides the perfect backdrop for bands, outdoor movies, and other performances. Visitors can access the Pocket Park via a ramp or stairs from the Grand Street parking lot, or through street front access on Main Street. 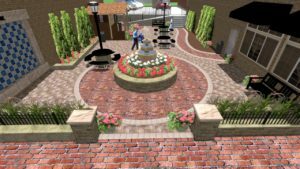 The Pocket Park provides free wi-fi access (donated by Infrastructure Technology Solutions and Monticello Carpet and Interiors). Guests also enjoy ample seating and seasonal plantings. One of our most exciting features is the student art wall. 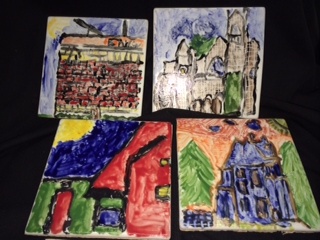 In collaboration with the traditional third grade curriculum and the study of the History of Monticello, each third grader in Monticello created an art tile depicting a scene from historical or present day Monticello. The Pocket Park committee would like to thank Maria White (Maria’s Art), Leanna Manternach (Sacred Heart Elementary), Missy Gadient, Tricia Lambert, Robyn Ponder, and Jackie Tighe (Carpenter Elementary) for their time, talents and resources. The Pocket Park committee of Mary Phelan, Past Chamber Director; Doug Herman, City Administrator; Leslie Althoff, ITS; Mike Bowman, Shimanek, Shimanek and Bowman; Erin Danneman, The Jitney; Josh Iben, 151 Landscaping; Sandy Moats, Monticello Carpets and Interiors thank all who have so graciously donated. The Pocket Park fundraising campaign thank you’s are endless. Private donors, businesses and grants contributed $90,000 of the total fundraising of $105,000. Donors are recognized in several areas throughout the Pocket Park. 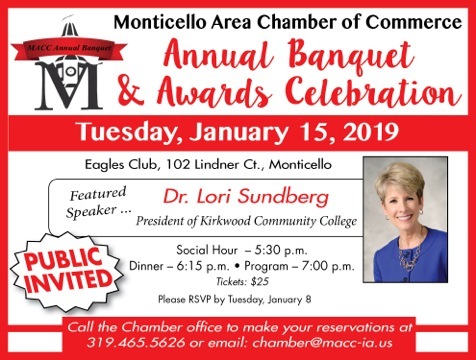 For more information, please contact Jan Hoag at the Chamber Office at 319 465-5626 or email chamber@macc-ia.us.